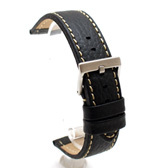 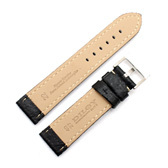 This is a flat padded black bison (buffalo) leather watch strap with rice coloured detail stitching, anti-allergic nubuck lining and a heavy duty brushed / matt steel buckle from the Diloy Elite Range in a regular length. 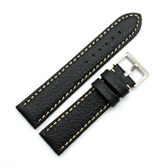 This strap will fit any watch were the distance between the lugs is 18mm, 20mm or 22mm (depending on the size you buy). Like all of our products, it is brand new and in stock in the UK, ready for our super fast shipping.